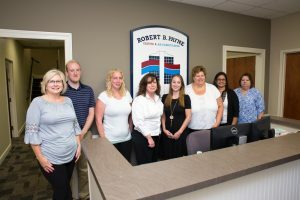 About Us | Robert B. Payne, Inc.
Our Company was formed in 1930 by Robert B. Payne, who, with a horse and buggy, started a business delivering wood and ice to local homes. In the late 1930s, Mr. Payne expanded his company by moving into a new home heating product – coal. He had to buy his first boxcar of coal on credit. In the early 1940s, the Company again expanded, moving into what was then the newest home heating product – fuel oil. In the late 1950s and early 1960s, the Company, then run by R. Cameron Thompson, again broadened its product line, but this time it was a move away from home heating products. This time it was a newly invented product designed to cool the home, not heat it. That invention, of course, was air conditioning. One of the Company’s first air conditioning installations was in the Virginia Electric and Power Company building on Water Street. We continue to service that building today. Today, Robert B. Payne, Inc. no longer sells wood, ice, or coal. We do continue to sell fuel oil. In 2000, we purchased the remaining home heating oil accounts from Foster Fuel and Cool. Since 1930, Robert B. Payne, Inc. ownership still remains in the original family. R. Cameron Thompson, III and Robert B. P. Thompson continue the same commitment to quality with which their grandfather started, allowing us to become Fredericksburg’s Premier Heating & Air Conditioning Company. You can B sure of Robert B. Payne, Inc. for all of your comfort needs. Message from Robert B. Payne, Inc. Thank you for the opportunity you have given to us here at Robert B. Payne, Inc. as you consider who will be your indoor comfort provider. We understand you do have a choice. We hope that we will earn your business! I feel privileged to be able to continue my family’s legacy of serving so many families and businesses that live and work in our area. Just like my grandfather and father who worked so hard to build this company before me, my commitment remains uncompromised in ensuring our customers’ needs are fulfilled with respect, honor, trust and reliability. Our employees will provide you with friendly, quality and professional craftsmanship. Each is truly dedicated to doing what is in the best interest of you, our valued customer. Together our team pledges its unwavering commitment to ensure your total satisfaction. In the unlikely event that you encounter problems with product or service, I am here, and available to you, and I will personally guarantee a resolution to your problem. On behalf of the entire Robert B. Payne, Inc. team, thank you for the opportunity to serve you!